Scene: Work. Several years ago, a friend of my then-boss had died and my boss and some friends were working on the program for his funeral. A proof went out to all of the collaborators during deadline week, and I looked at the proof to check for any obvious errors. I found one–the words to a song (one I’d grown up singing) had been misprinted. I emailed the correction to the person collecting the revisions for this stage, and got a phone call. Him: You’re wrong – the lyrics you sent aren’t correct. Me: I grew up singing the song. I can send you a copy from a book, if that would help. Him: No. The lyrics you sent are wrong. Me: I respect you and I don’t want to drag this out, but can you tell me what it is that makes you sure of that? I looked it up on a few sources to make sure I wasn’t misremembering. Him: What you sent is wrong because it’s not actually right. Thanks for your help, though! Scene: College. I took an apologetics class in my last year of education at a religious university, a required course meant to equip students to defend the faith in which they (and, at the time, I) believed. We spent a semester memorizing arguments which corroborated our beliefs, while congratulating ourselves for mischaracterizing the beliefs of our opponents and then shooting down the shallow misrepresentations we’d made. Student, giving presentation: So [followers of Religious Group X] wear funny underwear, can have as many wives as they want, and get a planet when they die. It’s basically religion for the non-monogamous sci-fi nerds, and their beliefs are sooo far out. I mean, planets–really? The class laughed, threw out some passages from our preferred religious text that we understood to disprove what we now understood as [Religious Group X]’s beliefs, and then moved on. The months of that class were most disheartening, frustrating, embarrassing, and intellectually dishonest experience of my life. Scene: The internet. A particular pastor–revered by the people with whom I went to church and college–who we’ll call Don Fifer has a blog where he is willing to share his thoughts on just about anything. Frustratingly often, the “just about anything” includes declarations about natural disasters–that a tornado, for example, is sent from God as judgment upon a city for allowing a religious denomination to hold a conference to discuss increased inclusivity in a religious sphere. I won’t bore you with a list of quotes, but suffice it to say when there’s a natural disaster (in any town except Colorado Springs, CO), I go to this guy’s blog or Twitter account, waiting to discover whose sin he’s decided caused it. Ali Almossawi has written a short and lovely book, one I wish I could take with me back in time, where I could pause an argument and direct my opponent to a given page of Almossawi’s book. 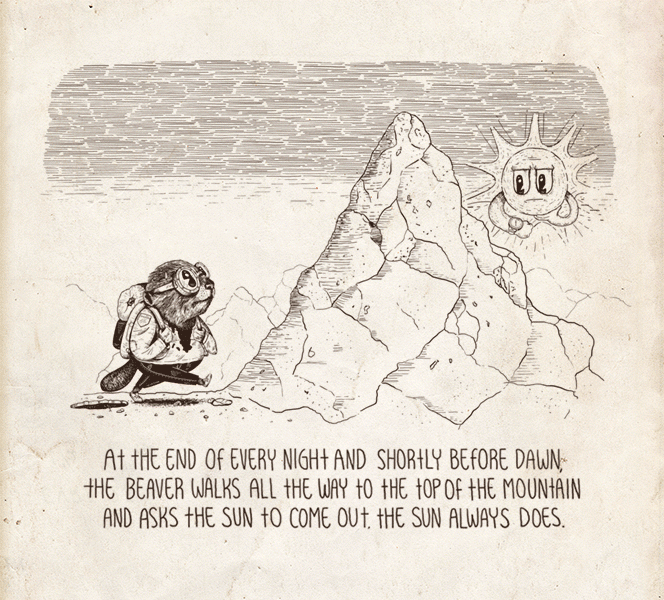 Only 64 pages long, An Illustrated Book of Bad Arguments focuses on nineteen logical fallacies, each with a drawing depicting the fallacy and an explanation of the fallacy. Originally published online in 2013 at no cost to readers, An Illustrated Book of Arguments is now in its second English print edition and has been printed in five other languages as well. One needn’t spend much time on the internet to realize how desperately needed this book is. To spend time browsing news websites, Facebook, or YouTube (transgressors listed in ascending order) is to be inundated with poor arguments–lots of ALL CAPS and exclamation points attempting to convey a typer’s sincerity, but disappointingly poor content in the actual arguments themselves. I continue to believe that if people just knew better, they’d argue better–after all, who wants their lack of logic to keep people from assenting to their perspective? 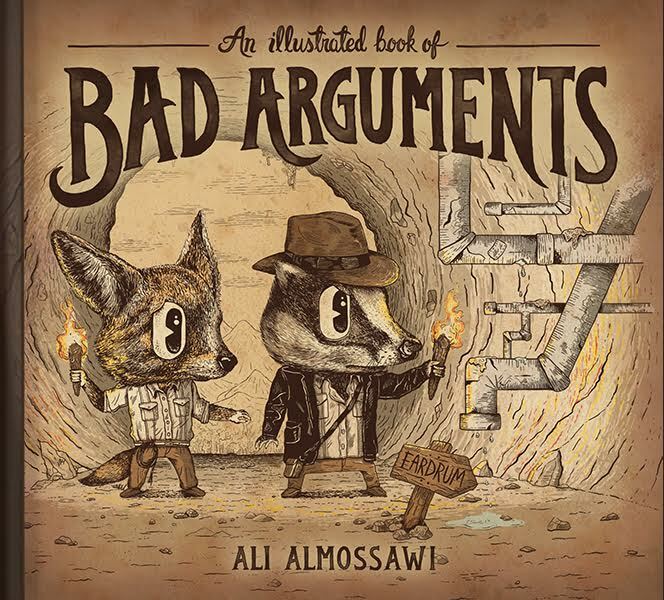 Avoiding logical fallacies takes you much farther than yelling does, and never has learning those fallacies been as accessible or prettily illustrated as in Ali Almossawi’s An Illustrated Book of Bad Arguments. An Illustrated Book of Bad Arguments is available now at Greenville Public Library.